"I would just like to say; I've had many massage therapists, but Meighan is the best! I came to her with really bad shoulder pain, not even sure what areas the pain was generating from, but Meighan hit the right spots right away! She suggested a few massages, which greatly helped my situation! Even showed me a comfortable position to lay in bed when in pain. You get your time & money's worth." "Meighan showed flexibility, caring, professionalism, and compassion in her Chi-Kung healing sessions for my young daughter, who was suffering from anxiety. My daughter was reluctant to go at first, but Meighan read her energy blockages easily and my daughter came out of each session calmer and more centered. I believe that it was her sessions with Meighan that helped her turn the corner and begin rapid healing." "Meighan has an uncanny ability to sense what my body needs. 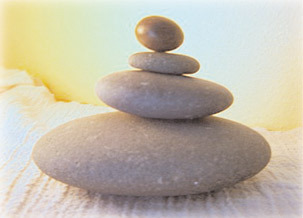 Within a few hours of a Qigong massage, I feel fully relieved of the stress I have been harboring." "Meighan's passion for what she does creates a very peaceful and effective healing environment. Her knowledge of the body and her excellent palpation skills makes me feel that her hands "know exactly where to go." She is very professional yet inviting, which gives me great confidence referring my patients and my family to her." "Meighan's pleasant disposition and high degree of professionalism makes your sessions very satisfying. She strives to get to the root of your problems and continues to work on those areas until healed. I would highly recommend Meighan for massage therapy." "Meighan is an excellent Chi Kung teacher (I have had three). She presents the practices and theory in an organized and logical manner. She is always friendly, open and concerned that we are comfortable in how we are learning about Chi Kung. Her enthusiasm is contagious. It makes me want to learn more and more!" "Meighan had offered a six session Chi Kung class at the Gardens of the Fox Cities. Now on my third set of classes, Meighan has helped me gain a greater understanding of Chi Kung, meditation, and energy healing while guiding me to find inner balance. In class, Meighan has a quiet, professional demeanor which enhances her abilities as a teacher and guide. During private sessions of Energy Body Healing Meighan works to meet my personal needs. In these private sessions Meighan is caring, concerned, and reassuring. I find her in all ways to be a therapist and guide whom I trust and respect." "I am part of that group of us always looking for peace, serenity, and balance. Quitting smoking over four years ago increased my need for alternative ways of handling stress in a healthy manner. I have practiced yoga and worked on meditation. I first saw Meighan for massage and we began working on trigger points. Those tiny balled up clusters of muscles can be painful but the rewards are so great in terms of relaxation in my muscles. I have also begun Chi Kung and I have found it to be extremely satisfying and feels it adds a whole new dimension to meditation and a contemplative mind, as well as a source of energy through movement, concentration on thought, and learning to breathe completely. For anyone looking to feel better, both physically and mentally, I highly recommend seeing Meighan. I have finally found the tipping point to letting go completely through Chi Kung and I then in turn get so much more out of the massage, as our physical relates to our mental relates to our spiritual. Having balance and flow throughout is a wonderfully energizing and yet calm experience. Who knew!!" "Every month I look forward to my one hour massage. It is always so relaxing and therapeutic! Thank you so much Meighan for the knowledge and insight you share about health, body, mind and spirit. You truly are gifted!" "Meighan is very professional and well learned in her art of healing. She is intuitive to what your body and mind need to heal. Her integrative therapeutic massage will have you wanting more!"